Do you have unwanted hair growth that takes you hours and money to wax away or tweeze every week? Electrolysis by Judy costs the same as all of the products you have been buying, but will be permanent so you will never have to buy wax, or tweeze again. Do you have darker skin tone? Laser will not work for you. Electrolysis is the only answer, and Judy is the best in permanent hair removal in Charleston, SC, including Summerville, West Ashley, Mt. Pleasant, Goose Creek, and James Island. Call Judy's Electrolysis today to book your free hair removal consultation 843-871-1020. Electrolysis is the only FDA approved permanent hair removal process. Were you thinking of trying laser? Think again. Laser is not proven to be permanent and most customers of laser hair removal often have to go back one or two years after they stop treatment. Judy Smithson has been providing electrolysis to clients for over 30 years. Her expertise and skill means that she can treat just about any unwanted hair growth. 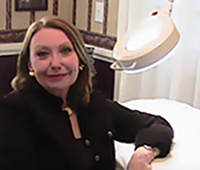 She is a doctor recommended electrologist wanting to give you the confidence you deserve. Electrolysis is the only FDA approved permanent hair removal process. Judy uses shortwave electrolysis to permanently remove unwanted hair growth. Shortwave Electrolysis is the only form of electrolysis that is approved for use on pregnant women and is considered the safest permanent hair removal. Call Judy today 843.871.1020 to schedule your free consultation.